GitHub - weiweihuanghuang/Work-Sans: A grotesque sans. Want to be notified of new releases in weiweihuanghuang/Work-Sans? Some glyph drawings have been updated (improved! ), kerning has been fixed in some areas. Reflow will occur, things will get a tiny bit tighter in some areas. For the desktop OTF fonts: since new taller and deeper glyphs have been added, using these in certain software will have increased line-spacing (for Adobe apps, it should be the same). A SIL Open Font project titled 'Work Sans'. Work Sans is a 9 weight typeface family based loosely on early Grotesques — i.e. Stephenson Blake, Miller & Richard and Bauerschen Giesserei. The core of the fonts are optimised for on-screen medium-sized text usage (14px-48px) – but still can be used in print well. The fonts at the extreme weights are designed more for display use. Overall, features are simplified and optimised for screen resolutions – for example, diacritic marks are larger than how they would be in print. The fonts under /fonts/static/OTF are OTF fonts for desktop programs such as the Adobe Suite or Office (Office fonts are only styled linked for Regular and Bold). The metrics are set so that they are more consistent across desktop programs. The fonts under /fonts/static/TTF, /fonts/static/WOFF, /fonts/static/WOFF2 contain formats for web use. They have been autohinted with ttfautohint. The fonts under /fonts/variable are variable TTF fonts. This typeface was funded by Google and is distributed by Google Fonts – many thanks to Dave Crossland for the commission. Please see BUILD.md for build instructions. If you spot any errors or have any suggestions for improvements you can fork this project, create an Issue or email me at wweeiihhuuaanngg@gmail.com. The project started in June 2014 and the brief was to have a minimum viable product (alpha release with 9 weights) by December 2014. 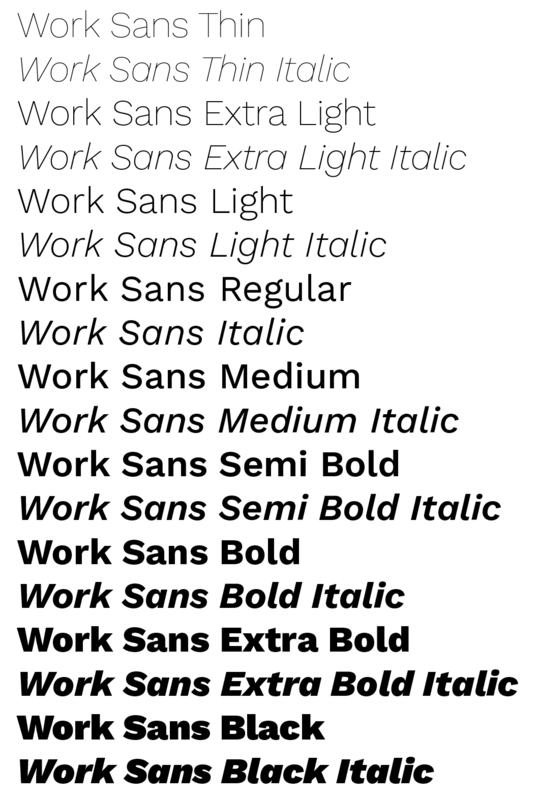 Work Sans was first available on Google fonts in July 2015. Hjerteleg tusen takk til Tone Sjåstad for her suport, patience, encouragement and inspiration throughout the process. Many thanks to the following who provided valuable feedback and encouragement: Mathieu Cannavo, Vincent Chan, Greg Gazdowicz, Jack Jennings, Seb McLauchlan, Dan Milne, Scott Rankin, Dan Reynolds, David Jonathan Ross, Adam Twardoch, David Wise. Thanks to Simon Egli for inviting me to work together on Metapolator in the first place. Thanks to everyone who was in my pocket the whole time. To view the copyright and specific terms and conditions please refer to OFL.txt.